In 1927, I wonder if the designers at Harland and Wolff’s at Govan near Glasgow had any idea that their creation would be still around in 2001. 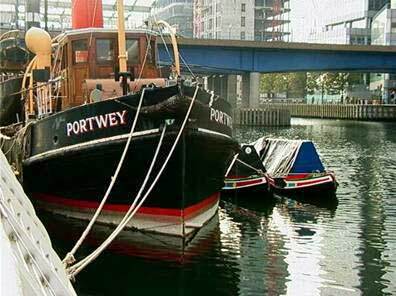 Portwey was designed as a coastal and harbour tug for the Portland and Weymouth Coaling Co. to form part of the essential coaling fleet needed to keep Britain’s vast commercial fleet moving. 80 feet (24.3m) long by 18 feet (5.5m) wide with a displacement of 330 tons (9’ draft), Portwey is a typical British tug of the period used for towing barges, pulling and pushing (a period equivalent of the now common bow thrusters) ships about and taking fresh water to ships. She also carried Pilots out to ships. She can do 9 knots, if the boiler crew can keep the pressure up to 140 p.s.i., and went out in all weathers. Now one of only a handful of operational coal fired twin engined steam tugs in the world, Portwey is lovingly preserved by a small band of volunteers belonging to the Steam Tug Portwey Trust Ltd, a registered charity. Although belonging also means every member is involved in fund raising in order to keep this 74-year-old lady working. Recently we have carried out major boiler works, hull repairs, are about to commence replacing some of the wooden decking, and to rebuild the unusual double-ended sailing lifeboat. Last year I made contact with Andrew Burge of South Midland Water Transport who arranged a shipment of 20 tons of Polish coal on Greyhound and Kangaroo (1927 also), via Braunston and the boat show at Waltham Abbey. Figure 4 - Greyhound and Kangaroo waiting unloading at West India quay. Then via Limehouse and out onto the Thames, thankfully given the freeboard available on a calm and quite Sunday morning. The narrow boats set off about 06:15 when the tide was just on the ebb, then round the Isle of Dogs and into the massive sea lock. One of the problems we had considered was how to get 20 tons of coal from below the waterline in a narrow boat hold, over the side of the tug and down through a 2’ diameter hole into the bunkers. The solution was disposable 1-ton builders bags and a very helpful little crane from Simmons Industrial Services Ltd. Figure 8 - Kangaroo and Greyhound arrived! The bags were lifted up above the hole and cut with a knife on a stick causing the coal to rush down into the bunkers. This was a sobering experience when one thought of years gone by narrow boat crews shovelling a hold empty. The whole operation went smoothly and was completed in about 4 hours, not bad for 20 tons. Kangaroo and Greyhound departed immediately to catch the tide and raced back to Stoke Bruerne travelling back in about 20 hours ‘on the fly’ (through the night). 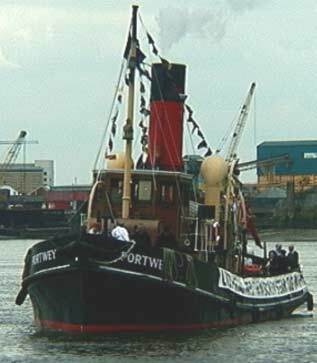 Portwey steamed in the dock and then this year steamed down to Strood and back and on the Thames twice. Other than the occasional maintenance item, the season went well. We are now thinking of next year. Portwey is 75 on the 10th August 2002 and the occasion must be celebrated. However, we have run out of coal and need some more. Unfortunately, we have also spent some £6000 in dockyard bills recently and do not have funds for a full 25 tons and a smaller quantity needs to be supplied. 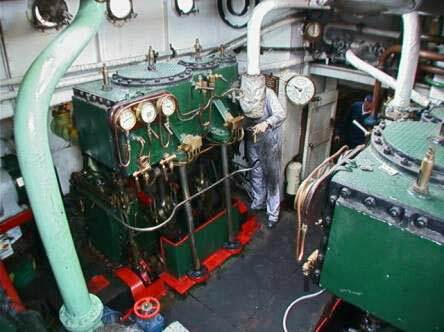 ©2001 The Steam Tug Portwey Trust Ltd.